This card game invites you to revisit the moments that defined your life with the people who matter most. A long-forgotten memory, no matter how small, silly, or trivial, can bring unspoken joy and can illustrate the great themes of our lives. Ever since designer Brian Mooney created Storymatic, fans have asked him to create a game to help them access the incredible stories they carry around with them. 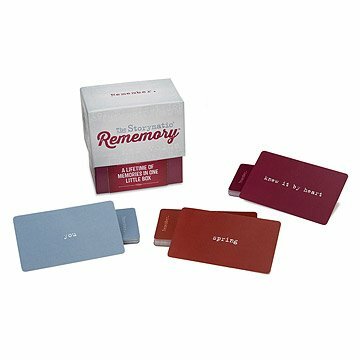 Rememory is a thoughtful card game perfect for anyone interested in exploring the depth of his or her memory while creating new treasured moments with family and friends. To play, each participant picks three cards: one that says the person with whom the memory must include, which could be a grandparent, friend, or sibling; one says a time frame; the third has a loose prompt such as "that sound that still resonates" or "the accomplishment." The player then shares the memory conjured by the three cards with the group. Perfect for family game night, reunions, and dinner parties, this inspired game encourages us to revisit the moments that defined our lives in order to discover pieces of own stories, and to share a deeper connection with friends and loved ones. Two 25-card decks with 180 memory cards. Made in Battle Creek, Michigan. Click here to see game instructions and ideas. This was a great way to spend Christmas evening. It was great having 3 generations of people gathered around the table and laughing! A game that all can win! This is for those who love to play games during get togethers but are so competitive tempers flare...a game everyone wins when they learn more about each other! I sent this gift instead of flowers to a friend for her mothers funeral. I thought the act of "remembering" special times through a game, bringing back good memories from the past out weighed a short lived beautiful floral arrangement. She told me she is looking forward to this gift as time permits with her siblings. I am happy with my choice. It was so much fun to play with older generations. The game had them discussing their memories we never would have known about. Often hysterical memories. It was great fun for all who played. It has the ability to open discussion. Folks have stories they want to share! This gets them started! I bought this as a gift and it is a fun game to play between two people. Love this game for getting to know my partner even better and sharing things we haven't discussed before.